Oprah has gone from handing out cars and trips to Australia to giving away reality shows like they’re part of her Favorite Things gift basket. Today Oprah’s TV network, OWN, announced several new shows in their fall lineup – including a reality show featuring La Toya Jackson. Life with La Toya will show off the Jackson family sister as she “juggles the many demands of her famous family, her lifelong friends, and her growing entertainment business empire”. La Toya is no stranger to reality TV, as she starred in that quickly canceled gem Armed & Famous back in 2007 and also did a stint on the British version of Celebrity Big Brother. TELL US – WILL YOU TUNE FOR A GLIMPSE AT LA TOYA’S LIFE? The Real Housewives of Beverly Hills finally had a reason to celebrate this weekend as Lisa Vanderpump’s daughter tied the knot! Pandora Vanderpump, who was featured on the first season of the hit show, is Lisa’s daughter with husband of 29 years Ken Todd. Pandora got married to beau Jason Sabo on Saturday! RadarOnline reports her nuptials took place — where else — but at her parent’s lavish 15,000 sq ft. Beverly Hills estate. 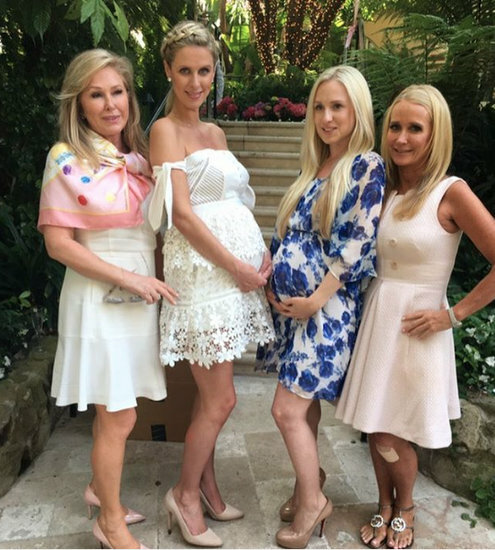 In attendance were 275 guests including some of Lisa’s RHOBH costars – Kyle Richards, Camille Grammer and Adrienne Maloof. Taylor Armstrong was not in attendance for obvious reasons. Celebs who attended the bash included Latoya Jackson, Janet Jackson and Star Jones. “I can’t explain the love and warmth that filled the room and our hearts last night,thank you all for your messages,my daughter is married!” tweeted Lisa yesterday. Radar reports Bravo cameras were not on hand to tape the wedding but some photos posted online show camera crews taping Pandora as she prepared to walk down the aisle. Perhaps Bravo taped the preparations but not the actual event. Some photos from the wedding are below! In other news, TMZ is reporting that just a day after Russell Armstrong committed suicide, a business associate of his also took his own life. The day after Russell’s body was found hanging, Alan Schram, the managing partner at an L.A-based hedge fund, was found dead on August 16 outside of his car with a gunshot to his head. The L.A. County Coroner concluded Alan’s death was a suicide. Taylor and some of her RHOBH castmates reportedly expressed shock over Alan’s death and the timing at Russell’s memorial. While Russell’s attorney has publicly stated he was in deep financial trouble, it is unknown whether Alan was also experiencing financial difficulty. No word yet on whether or not Bravo will be blamed for this tragic death as well. And finally, the Huffington Post is reporting that Taylor Armstrong and her daughter Kennedy are now living at the home of Kyle Richards in their time of grief. The report adds that as of the moment, Bravo is still planning to premiere the second season of the show on Sep. 5. CLICK THE CONTINUE READING BUTTON TO SEE PHOTOS FROM PANDORA’S WEDDING!